Mary Blake has a plan. A recent graduate of the Master of Science in Infectious Disease and Global Health (MS IDGH) program, she intends to continue her education to become a physician assistant. Mary’s long-term goal is to eventually work in developing countries, inspired by Doctors Without Borders and other professionals who go overseas to help with infection control and prevention, as well as educate others on these topics. 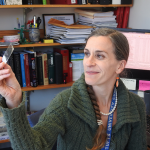 Upon her graduation from the MS IDGH program, Mary secured a position as a research associate. And, recently she accepted a new position as Infection Control Analyst for the City of Forth Worth, Texas. In her new position, Mary is responsible for ensuring facilities are in compliance with infection prevention protocols and regulations. Below, Mary reflects on her time as a student at Cummings School, from both an educational and personal standpoint. What led you to the MS IDGH program? Prior to coming to the program, I worked at the Mary Crowley Research Center, a cancer research center for clinical trials. 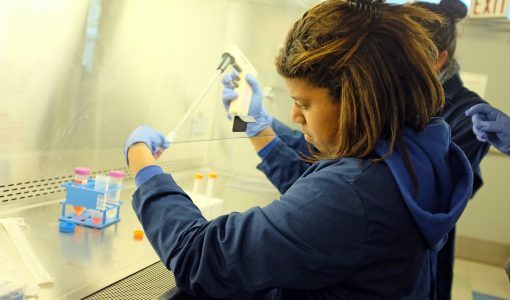 I had always planned on getting my master’s degree and, with a bachelor’s degree in microbiology, the MS IDGH program was a perfect fit. It was exactly what I was looking for and put me on a career track I am successfully following today. Who was your favorite faculty member? I would have to say my favorite faculty members were Dr. Gillian Beamer and Dr. Patrick Skelly. They are relatable, personable, approachable, and friendly. They have a good way of breaking down the material to where it sounds simpler, and then help to build upon that. What is the most important thing you learned during your time in the MS IDGH program? There are a lot of times where you’re introduced to a new topic that you’re going to be covering in class and initially it seems overwhelming. But the most important thing is to break it down, and then build upon it, and not to overwhelm yourself with so much so soon. 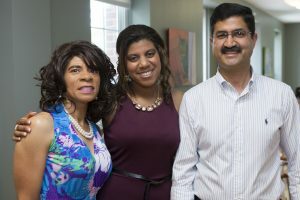 Mary (center) celebrates her graduation from the MS IDGH program with her mother and program director, Dr. Abhineet Sheoran. If you have a dream or goals, don’t let bumps in the road get in the way. The program director, Dr. Abhineet Sheoran would tell us not to beat ourselves up over small things. Whether you want to go to veterinary school, go the PhD route, or start a career—whatever your goal is, keep working toward it. What is your favorite memory from the MS IDGH program? My favorite memories were of my classmates. We became very close. My favorite times were when we’d have a project and all go to the library and order food, and we’d study together or work on the presentation that was due.